Our question today is from a student who is frustrated, feels defeated, and is seeking for some advice. The medical school journey is hard. There are hiccups along the way. Knowing how to get back up and why you’re on this journey in the first place is very – very – important. Questions here are taken directly from the Nontrad Premed Forum. This podcast is part of the MedEd Media Network where we have a ton of shows, including a couple of them for medical students. 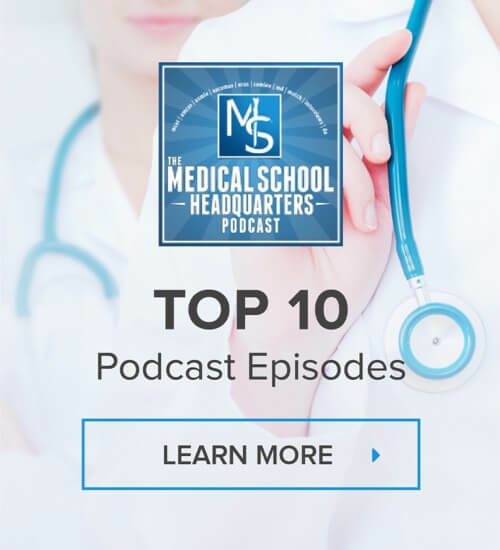 As you go through your journey once you get into medical school, you can listen to Specialty Stories, where we interview physicians about their specialties, as well as the Board Rounds Podcast, a podcast specifically for first and second-year medical students to help them prepare for Step 1 or Level 1 board exams. “It’s been a while since I have posted. I am officially full time at school this semester and I am definitely feeling it. I was able to go down to part-time at my job and keep the same hourly rate which is very, very helpful for my husband and me. I put in about 20 hours a week at work and almost all of my free time goes to studying, trying to get 8 hours of sleep and whatever is left I try to see my husband and family. Although most of my time is devoted to studying, prepping for classes, doing projects I feel like I am perpetually behind. I am taking 3 classes (Bio, Prep Chem (designed to prepare me for Gen Chem 1 & 2), and Stats, 4 if you count the Bio lab that requires weekly lab reports and quizzes on top of the lab. Everything appeared to be going smoothly. I have been organized, eating right, 10 min meditations to get me ready for the day and to ease stress. Haven’t been struggling too much with focus while studying. My bio class is by far the hardest class I have ever taken in my life. It is unlike anything I have ever taken. My professor and TAs all warned my classmates and me that this is an extremely hard class and half the class would fail. As like many of you I am sure, I hadn’t taken a science class in over 10 years so I knew it would be an adjustment. Many students on this journey fail their tests. I failed a test. I failed my first medical school exam. You got a B minus on the test and 66.7 isn’t that very good. But if it curved back to a B minus, that tells me that the professors are not doing their job. They had fun making it really hard and they’re not doing their job of helping students understand the material. Students talk about it on the Facebook Premed Hangout Group where professors are getting fired for this exact reason where they just like to give hard tests and liking to see students fail. But even if you’re in a class where the professor is great, you may still fail. And you may still feel defeated even with the professor you love because there will always be hiccups along the way. All you can do is to continue to go down this path if this is what you really want. Put one foot in front of the other – every single day, page after page after page, question after question after question. You may walk out of the test feeling defeated and you may get your grade back and feel defeated. But all you need to ask yourself is what did you do wrong? How can you improve? And this is how you get better. This is how you don’t get feel defeated and that’s how you can conquer. As you go through this process, expect that you’re going to fall down at some point. But as soon as you figure out how to get back up and you know why you’re getting back up, then you will get back up and continue on this journey.